2. You are set to depart and you may or may not return to your home. Make this journey to Allaah’s House as Allaah wants it. Think of the next journey that is surely coming, the one that leads to the meeting of Allaah, Most High. This raises questions like: What did I prepare for that Day? Am I following Allaah’s Commands? Am I a follower of the sunnah of MuhammadsalAllahu ‘alayhi wasallam? Do I really know of Allaah? Am I a believer that Allaah is above the seven heavens over his ‘arsh as He has stated in His Book and as His Messengers have asserted? Am I a believer that believes Allah has a true Face that suits His Majesty as He has affirmed in the Qur’aan and as has been affirmed by His Prophet Muhammad salAllaahu ‘alayhi wasallam? Am I a believer in all of Allaah’s Names, Attributes and Actions which He has affirmed in His Book and by His Messengers? Or do I just take and accept by my doubt, rejecting, or distorting the meanings of Allaah’s Attributes and Actions? Say (O Muhammad salAllaahu ‘alayhi wasalaam): “(Yes) verily, those of old, and those of later times. All will surely be gathered together for appointed Meeting of a known Day. to mankind the Hajj (pilgrimage). They will come to you on foot and on every lean camel, they will come from every deep and distant (wide) mountain highway (to perform Hajj). The talbiyah you make is in response to the Prophet Ibraaheem’s proclamation to visit Allaah’s house of worship. Allaah is Most Great. Let one commit himself to repentance, having a good opinion of Allaah, hoping that Allaah will grant him security from His Punishment. 6. You will enter one of the gates of al-Masjid al-Haraam. 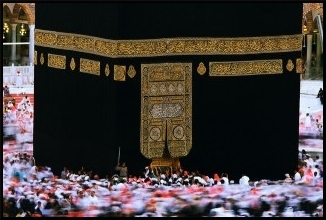 Then there you are before the magnificent House of Allaah, Most High, the ka’bah. Now you see what you hoped to see for a long time. Thank Allaah subhanahu wa ta’ala for making this possible and hope that He ‘azza wa jall will grant you the greatest reward of seeing His Majestic Face on the Day of Resurrection. This thankfulness is not just in saying “alhamdu-lillaah,” but also by obeying Allaah while on hajj and for the rest of your life. 7. You start your tawaaf knowing that it is a great time for magnifying Allaah the Exalted. Remember Him ‘azza wa jall by His Names, Attributes and Actions. Also while in tawaaf try to reflect upon the time when Prophet Muhammad salAllaahu ‘alayhi wasallam was prevented from doing the same thing you are doing today. Then think about what he did in clearing out the site from the symbols signifying worship to other than Allaah! All idols were demolished. Busy yourself with du’aa. Ask Allaah, the Most Great, to make you hold to the correct belief and Path of the salaf and make you die on it. Ask Allaah to save you from all forms of shirk andbid’ah.